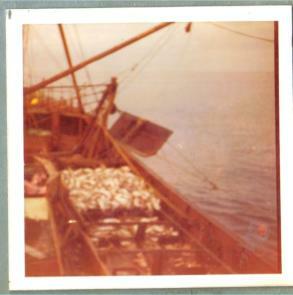 Story and pictures by kind permission on Don Armour Ex Trawler Radio Officer. The trawler Radio Officers were, by and large, a nomadic bunch, working a running agreement rather than a specific contract, they signed on at the start of a trip and signed off at the end of the trip. Some Radio Officers tended to stay with the same ship, or at least the same fishing company for quite protacted periods of time, while others tended to change from time to time, of course the trawler life was not everybody’s cup of tea and some did not last very long in the fishing industry. 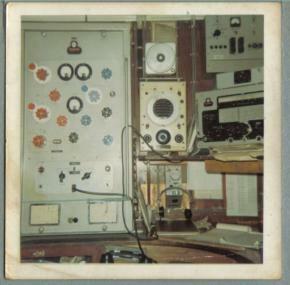 The above picture is a ship in which I sailed MFV ALDERSHOT and I also include a few photos of this vessels radio room. 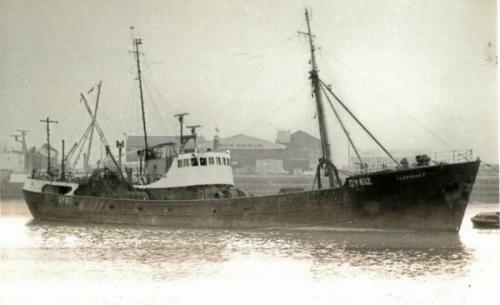 The Radio Room has a callsign on the bulkhead GZTJ which was the collective callsign for the Consolidated Fisheries Company. 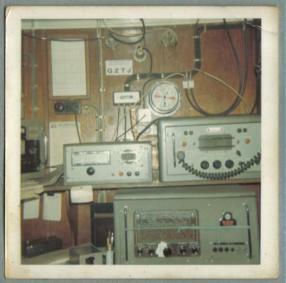 The Radio Room also shared space with the chart room and the medicine chest. Sometimes the vessel’s skipper handled all first aid and minor medical matters but sometimes this job was delegated to the R/O, of course anything serious was a “going in job” or perhaps even a rescue at sea. Sailing out of Grimsby, we passed up the east coast chain of of coast stations, Humber Radio GKZ, Cullercoats Radio GCC, Stonehaven Radio GND, and Wick Radio GKR. Wick Radio was our main coast station while on the Iceland and Norway coast fishing grounds, round the corner into the Barents sea, life became a little more difficult communications wise and we often had to be a bit more creative. I recall on one trip, trying to set up a telephone link call from the Barents sea via Portishead Radio GKL but to no avail, I finally got my call and made strength five contact with the area station at Cape Town Radio ZSC, some 6000 miles away! On the fishing grounds, in addition to the traffic lists, and 500khz distress watch, there were three skeds a day, one in the morning, intership sked, reporting in code, what we had caught (and if you believe that ANYONE told the truth, then you simply don’t understand trawler skippers!) The afternoon sked was ship to shore and consisted of a report to the office of the catch for the previous 24 hours.The third sked was in the evening was another inter-ship sked along the same lines as the morning sked. All the skeds were encoded in a company specific code. In the winter, one ship took a turn as Mother ship, there were usually three, one off North West Iceland, usually around Isafjord, one off South East Iceland, and the third somewhere in the vicinity of the North Cape of Norway. The role of the Motherships was to ensure that all the vessels in each area were still afloat and operating normally, it was purely a SOLAS consideration following the loss in 1968 of the Kingston Peridot, the Saint Romanus, and the Ross Cleveland. This duty was in addition to the normal fishing related activities and was usually taken up by the most recent ship on the grounds and handed over when that ship was on its way back home. It wasn’t a particularly demanding job, just a question of being on frequency at two specificic times of the day and making a note of callsigns as the other ships checked in and acknowledging their presence. The rest of the time was taken up with servicing equipment, radios, radars, Loran, Decca, Lights fuses batteries and Echo sounders. Reading through the ships library, monitoring the distress frequencies, scanning through the designated chat frequencies and of course chatting with colleaugues on other ships, there wasn’t very much in the way of telegram traffic, people were too busy, still the traffic lists had to be checked---and there was always the weather and shipping forecasts to get (quite tricky once outside the BBC areas). Of great importance were the racing results, the starting prices for one of the next day’s races and the news from Rugby Radio at about 21.50z.We tended to use Wick radio’s GKR CW calling and answering frequencies 1615khz/1623khz together with 8469khz and 12709khz rather than 500khz, with the option, of course of using other nations coast stations. Icelandic, Norwegian and for some parts of the Icelandic grounds, Irish. The weather, particularly in winter tended to make life interesting and I used to keep my morse key on quite a high tension to try and avoid double keying as we bobbed up and down, ploughed through the waves and generally rolled about quite a bit. 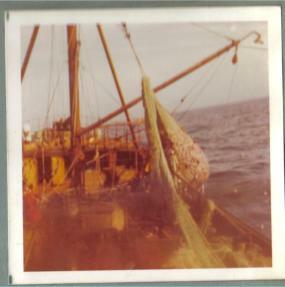 Homeward bound from the fishing grounds, it was back to telegrams and traffic lists, with a final report sent to the office, scrubbing the radio room floor,(this was a health isssue as we were carrying foodstuffs----especifically fish!!) general tidying up and compiling the dreaded abstracts, including resolving arguments with crew members over just how much they had spent on telegrams and Interflora!! The trips were usually three weeks out if we were going to Icleand or Norway and four weeks if we were going around them corner into the Barents sea, this was followed by three days ashore, it’s small wonder that the fishermen were known as “3-day millionaires”, then back out again. The pay was quite good in its day, the R/O was on a wage plus a percentage of what the catch was sold for when arriving home in port. The definition of a trawler R/O’s life was 90% boredom punctuated, often at regular intervals, by 10% sheer terror! 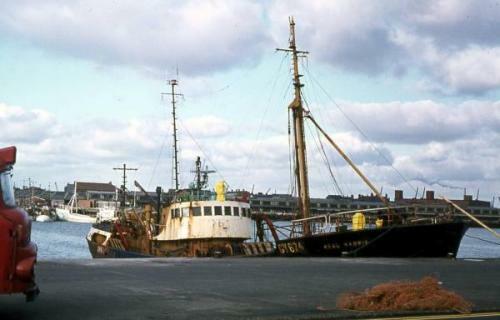 Back in 1987 I was in the Grimsby area, so I popped over to docks----what a shock---The North Wall of the Fishdocks, which, when I was sailing out of there, was so packed with ships that they had to tie up bows on, it was now only home to two little inshore Seine netters---how things change.